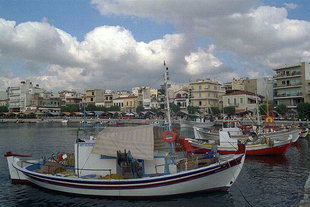 Sitia is on the north coast in the bay of Sitia. There is a regular bus service from Iraklion via Agios Nikolaos. The harbour is the best in the eastern part of the island and can accommodate small fishing boats and larger cargo and transport boats as well. The weekly boats for Rhodes leave from here. Around the harbour there are many restaurants and tavernas as well as coffee shops. East of the harbour of Sitia there is a sandy beach within walking distance from the town. There is a small airport but regular flights are few: at present there is one per week to Karpathos and Kasos and two to Athens. Sitia is a pleasant city and has all classes of hotels and tavernas during the tourist season. For travel details see Transportation. East of the harbour of Sitia there is a sandy beach within walking distance from the town. In Sitia there was a Neolithic and a Minoan site. In the location Petras, near the town, excavations that started in 1985 under the Greek archaeologist, Tsipopoulou, have so far revealed a major Minoan settlement with Palatial-style buildings, fortification walls, and many artefacts including a Linear A tablet. The site was destroyed by an earthquake, abandoned in the New Palace Period, and reoccupied later. In Greek times, Itia was the harbour of Praisos. References to the city in the third century B.C. refer to its citizens as Setians. When Praisos was destroyed by Ierapytna, Itia became the capital of the Praisian state. There were fortifying walls around the city of Sitia from the Byzantine period. These fortifications were restored by the Genoese and by the Venetians but were never very strong. In 1539, the pirate Barbarosa conquered the city and levelled the forts and the town. 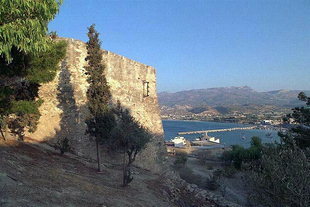 When the Turks invaded the island the Venetians destroyed the fort so that it would not fall into the hands of Turks. The ruins of a Venetian castle are still visible today. A tower of three storeys has survived. North of the fort there is a little chapel built from the ruins of a Venetian monastery destroyed by the Turks.